About two months after school started, I finally got a chance to watch my first Iowa football game. It was showering and was expected to stop any minute. But it didn’t actually matter whether it rained hard or not, we were heading to the football game. We were part of the people waiting in the cold rainy weather before it was even one o’clock. It was kind of crazy I thought, “do we need that much time in advance?” The answer is absolutely yes because you know it is all about football. For Iowans, the wait was definitely worth it! And you know what, we won! Staring at the really empty stadium, we stood where the players come out for a time until I couldn’t feel my feet. People flew out of that entrance all of a sudden, then there was a pause. This little kid went out. He dressed as the captain football player. And when he walked out, he greeted the first row with a big nice smile. He was like a professional football player, at least he’s going to be. There was one time when Herky came with a skateboard, he let Sean stand on and hugged him. It was such a lovely moment that warmed the whole stadium up. 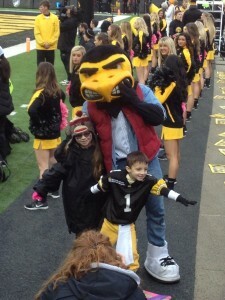 Go Kid Captains, Go Hawks!